The review is appreciative of Wasserman's work. Ironically, Patton's Greek accents are incorrect in three places. "This article surveys recent and previous research on the enigmatic Pericope Adulterae (PA), traditionally placed at Jn 7.53—8.11. The discussion is organized by the methodologies that scholars have applied to PA, and thus the article also demonstrates the various critical approaches in New Testament studies that have found popularity at a given time. While the following study will observe that some scholarly conclusions, such as the theory that PA did not appear in the original version of the Gospel of John, are near consensus, it will also highlight some remaining unsettled issues in PA scholarship." It is great that our blog is one of the two hottest issues in evangelical theology; but unfortunately I couldn’t detect much interest in textual criticism in Enn’s book Inspiration and Incarnation (2005); or in the debates initiated by it, for an introduction to these see e.g. Green Baggins and Digital Brandon. Now, however, WTS have released some of the internal faculty documents (debating papers), which are quite helpful in clarifying (some of) the issues that have divided their faculty. At a fairly basic level this reflects an important debate about the role of the phenomena of Scripture in clarifying and modifying a doctrine of Scripture derived initially from Scripture’s direct self-testimony; with a predictable division between the biblical scholars (‘yes the phenomena are really important’ - see the Hermeneutics Field Committee’s Reply to the HTFC, pp. 28-97) and the systematicians (‘phenomena? ha! they didn’t pose a problem in the 17th century so why worry about them now?’). But in this document we also have some discussion of textual criticism, as illustrating the principle that reformed theologians have had to adjust to the changes in the realia since the 17th century, and that Warfield in particular was at the heart of various theological adjustments in the light of hard evidence - in one case regarding the Long Ending of Mark (Hermeneutics Field Committee’s Reply to the HTFC, pp. 50-52). During a recent visit to Slovakia, I was informed that images of Codex Maurocordatianus, a C11-12 Tetraevangelium, are online here. This is part of a larger project to put old books online. "Such judgments [about the inauthenticity of the pericope] raise questions about what words like canonicity and inspiration mean for evangelicals. If we reserve the word inspired for the text in the earliest manuscripts, yet accept that other material (such as the pericope adulterae) should be included in our biblical canon, are we implying that select biblical passages may be canonical yet not inspired? If so, what should we do with this distinction?" 2. There is some Q & A with Dan Wallace about his trip to Albania by Derek Keefe. 3. Finally, there is a "classic" article on Textual Criticism and Inerrancy by J.I. Packer which answers the question, "How can I reconcile my belief in the inerrancy of Scripture with comments in Bible translations that state that a particular verse is not 'in better manuscripts'?" The long-standing Swedish series Coniectanea Biblica New Testament and Coniectanea Biblica Old Testament have been taken over by Eisenbrauns. Eisenbrauns have acquired all the backstock from the previous publisher. In celebration of this acquisition, they make available 55 of the titles at savings from 30-50% off retail here. My book is available on this sales here. 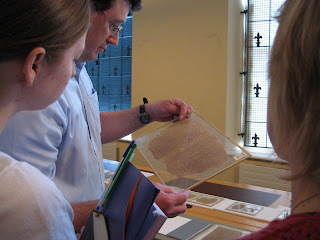 Almost two weeks ago now a group comprised mostly of MPhil and PhD students and I took a trip to Dublin to see the Chester Beatty Biblical Papyri. There is a wonderful general display, where some of the joined up sheets of both P45 and P46 were a highlight - these really help to visualise the respective codices as a whole - P45 is comprised of a series of single sheet quires, whereas P46 is one large single quire. We were also able to take a closer look at a large selection of leaves from the NT papyri (P45, P46, P47), courtesy of Charles Horton. Divers Manuscripts both Antient & Curious: Illuminated Treasures from the Harley Collection. One of the finest private libraries in Europe was formed in the eighteenth century by Robert Harley, Earl of Oxford and his son, Edward. Consisting of 7,639 manuscripts, 14,000 charters, and countless printed books, the collection was kept by the Harleys’ librarian, Humfrey Wanley, whose humble origins and lack of academic qualifications did not prevent him from becoming one of the most celebrated antiquaries of his day. After its purchase for the British nation in 1753, the Harleys’ private library was transformed into an unparalleled public resource; today it forms one of the most important foundation collections of the British Library. Access to the extraordinary riches of the Harley collection is now greater than ever courtesy of a generous Getty Foundation grant funding the creation of an online catalogue of illuminated Harleian manuscripts. By the end of the project, in June 2009, descriptions and digital images of over 2000 magnificent manuscripts, once thumbed only by a privileged few, will be available to all at the click of a mouse. To celebrate and advertise this achievement, on 29-30 June 2009, the British Library is hosting an academic conference on illuminated Harleian manuscripts. Scholars from all disciplines are invited to submit proposals for twenty-minute papers, but historians of visual culture are particularly encouraged to apply and preference will be given to presentations that include images. Papers that treat renowned Harleian holdings and those focusing on lesser known manuscripts are equally welcome. All potential contributors are encouraged to consult the British Library’s online Catalogue of Illuminated Manuscripts, which is rapidly expanding and currently supplies information relating to over 700 Harley manuscripts (here). Krister Stendahl, one of Sweden's foremost New Testament scholars ever has passed away on Tuesday, April 15, 2008 at the age of 87. Stendahl was former Bishop of Stockholm and former Professor of Divinity Emeritus and Dean of the Faculty of Divinity at Harvard. Harvard Divinity School has an obituary here. New York Times has one here. 29 July – 2 August 2008. The official homepage is here. There are 18 different seminars. I am invited as a guest and will present in Seminar 14 Textual Criticism (chaired by Profs. H.-G. Bethge, J. K. Elliott). a. Ulrich Schmid with Martin Karrer and Marcus Sigismund, "The text of the Septuagint quotations in the New Testament: A new tool in the making". b. Gert Steyn, "The Vorlage of the explicit quotations in Hebrews". c. Tommy Wasserman, "Significant NT manuscripts in Sweden with special reference to 1049". I will blog more about that paper at some later point (very exciting). Co-blogger Simon Gathercole is also presenting a paper, “Paradise in the Gospel of Judas,” in Seminar 18 (Christian Apocryphal Literature). Directly after the conference I will travel to the Münster colloquium. And the week before I will present at yet another conference Mark and Matthew – Texts and Contexts, in Århus, Denmark. "The course 'Christianity' (TEO D01, 30 ECTS credits) explores the origins and varieties of Christianity throughout the world today. It traces Christianity's development from a local group of Jesus followers to a worldwide movement of faith communities, the formation of Christian doctrines and identities and the emergence and reception of the Bible as Christian Scriptures. The course is offered entirely through internet communication technology, providing maximal accessibility and independence of location so that whoever wishes can enroll from anywhere on the globe." P. Oxy 4844 = P123, IVth Cent, 1 Cor 14.31-34; 15.3-6; images here. P. Oxy 4845 = P124, VIth Cent, 2 Cor 11.1-4, 6-9; images here. Up-date: These are now listed on the up-date site at Munster (here), so I have been able to add their identification in the NT papyri list. Up-date II: I have added links to the images and some more details from the publication in Oxy Pap 72. Unfortunately, I haven't been able to attend the Greer-Heard lectures which we have announced on this blog several times. However, summaries, analyses and photo's are available at the blog "if i were a bell, i'd ring". I would like to draw the attention to a nice web-resource, Dictionary of Art Historians, which is a growing biographical dictionary of Historic Scholars, Museum Professionals and Academic Historians of Art, with many entries of interest for our readers. "In 1932 he married fellow Goldschmidt student Josepha Fielder (b. 1904). Although not Jewish himself, his association with Goldschmidt, a Jew, and his refusal to join the Nazi party in order to teach as a Dozent at the University mandated his leaving Germany. He left Berlin for Princeton University in 1935, where he remained the rest of his life teaching and writing. His wife followed in 1938. At Princeton, he was a permanent member of the Institute for Advanced Study, initially engaged in preparing a corpus of illustrated manuscripts of the Septuagint with Charles Rufus Morey (q.v.) and Albert M. Friend, Jr., (q.v.). In 1938 he began his long association with Dumbarton Oaks, Harvard’s research center for Byzantine studies, presenting the paper, “Principals of Byzantine Book Illumination,” even before the center was fully established. In 1945, he succeeded Morey as professor in the department of art history. He and Friend conducted a manuscript seminar until Weitzmann’s retirement. His most influential book, Illustrations in Roll and Codex, a distillation of his principles of manuscript interpretation, appeared in 1947 (later revised and reissued in 1970). He held visiting positions at Yale (1954-55). In 1956 he began his long research association with the Monastery of St. Catherine on Mt. Sinai. 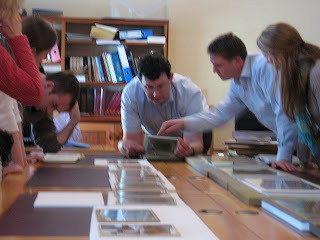 On his first visit he examined and photographed 2,000 manuscripts. Subsequent visits were sponsored by the Alexandria-Michigan-Princeton Expedition directed by George Forsyth (q.v.). In 1960 he was visiting professor at Alexandria University. Weitzmann presented a manuscript seminar at the Universität Bonn in 1962. Together with Ernst Kitzinger (q.v.) he organized the 1965 Dumbarton Oaks conference on Byzantine contribution to the art of the West of the twelfth and thirteenth centuries. Named emeritus in the department in 1972, he relinquished his Institute appointment, to be a visiting scholar at Dumbarton Oaks, 1972-1974. In 1977, Weitzmann organized an exhibition and symposium (with Margaret Frazer) at the Metropolitan Museum of Art, entitled, “The Age of Spirituality.” The show recapped Weitzmann’s originality in looking at the range of early medieval objects which both showed the unity of the objects and the adoption of pagan images into new meanings. In 1990 his St. Catherine’s Monastery research began to appear in book form. The first, published in collaboration with George Galvaris, was The Illuminated Manuscripts. . ."
I just wonder what it would have been like to be a student at Princeton some decades ago, going from one seminar with Weitzmann to the next with Metzger . . .
Daniel Wallace will be debating Bart Ehrman on The Textual Reliability of the New Testament. The debate is part of the Greer-Heard Point-Counterpoint Forum, a ministry of New Orleans Baptist Theological Seminary. On April 4-5, 2008, Dr. Dan Wallace, professor of New Testament Studies at Dallas, will participate in a debate with Dr. Bart Ehrman, chair of the department of religious studies at University of North Carolina Chapel Hill, over the textual reliability of the New Testament. For more information, please visit http://www.greer-heard.com/. 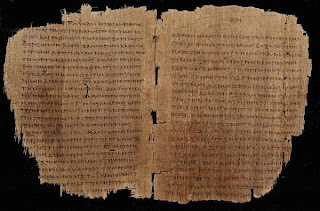 On the importance of textual criticism in synoptic studies: the case of ευθυς. Matthew uses ευθεως 10  times 4.20, 22, 8.3, 13.5, [14.22], 31, 20.34, 24.29, 25.15, 26.49, 27.48. Matthew also uses ευθυς 7 times 3.16, 13.20, 21, 14.27, 21.2, 3, 26.74. Mark uses ευθυς 40  times 1.10, 12, 18, 20, 21, 23, 28, 29, 30, 42, 43, 2.8, 12, 3.6, 4.5, 15, 16, 17, 29, [5.2], 29, 30, 42, 42, 6.25, 27, 45, 50, 54, 7.25, 8.10, 9.15, 20, 24, 10.52, 11.2, 3, 14.43, 45, 72, 15.1. Since ευθυς is a Marcanism, the probable conclusion is that Matthew has borrowed seven examples of ευθυς from Mark, but himself prefers ευθεως. This becomes a clear trace-element. Just what forensics want on a CSI investigation. Let's look at the Byzantine text. The Byzantine text has ευθεως 40 times and ευθυς 2 [Mk 1.12, and 1.28]. Neither of the examples of ευθυς in Byz Mark have an ευθυς in Matthew! Byz Mark 1.12 is parallel to a Matthean narrative-τοτε, a distinctive Mattheanism that is not picked up in Mark anywhere. Byz Mark 1.28 is 'Marcan material' that has no equivalent in Matthew [Byz or Alex]. What is remarkable, is that regarding ευθυς/ευθεως in the Byzantine text the literary flow Mark to Matthew does not exist. Yet the Alexandrian text has a clear literary flow from Mark to Matthew on this point. Alexandrians can point to ευθυς as evidence that Matthew used Mark. But that datum is only as strong as the textual theory.